Enjoy a peek into a few of the must see sites along the scenic byway. Stunning panoramic views of snow capped mountain tops, meadows bursting with wildflowers, unique rock formations and even a quaint country store. Located at the exact geographic center of California, North Fork is a beautiful community rich in history, art and tribal culture.The town's logging heritage also comes into play at the annual Logger's Jamboree. North Fork is a great jumping-off point for the Sierra Vista Scenic Byway. One picnic site is set overlooking Redinger Lake and boat launch. Grey pines, chaparral, intermingled with Valley Live Oak provide shade. Nearby Reddinger Reservoir offers a variety of recreational activities, including fishing, boating, hiking and wildlife viewing. Toilets are vault and handicapped accessible. No Water. Please pack it in Pack it out. As you head past Mammoth Pool and the Mile High Overlook, keep a sharp eye out for Eagle Beak on your left coming from North Fork. This aptly named rock formation is seems to watch over the byway from above as if they are sentinels tasked with protecting the natural beauty of the byway. Framed against a brilliant blue sky, the Eagle Peaks are a dramatic vision, just as much a testament to the erosive power of nature as they are to her beauty. Sierra Mono Museum is home to the largest displays of Mono Indian basketry in California. Other exhibits include weapons, games, ceremonial items, tools and beaded crafts. This historic structure was built in the 1860’s and continues to stand strong today. Just a short walk from the road, you can feel the history as you walk through the door. One truly interesting element is the old newspapers from the early 1930’s covering some of the walls. Located a curve in the road just before the Mile High Vista, this will be one of the first locations offering a spectacular panorama view of the Sierra National Forest's steep mountain peaks and stunning landscape. A good portion of the viewing area from the vista is within the Ansel Adams Wilderness. This alpine wilderness, named after the renowned landscape photographer Ansel Adams, is dotted with sparkling lakes, glacially sculpted gorges, and imposing peaks and spires. It covers an area of 230,258 acres, ranging in altitude from about 7,000 feet to 14,000 feet. See more at Mile High Vista. Just off of Forest Hwy 81, this stop offers one of the most spectacular views along the Sierra Vista Scenic Byway. From here, you can view the peaks that make up the "Heart of the Sierra Nevada," including the Minarets, Mt. Ritter (13,157'), Mammoth Mountain, and at least fifteen other named peaks over 10,000 feet in elevation. Directly below the vista is Mammoth Pool Reservoir and the San Joaquin River canyon. Visible are several granite domes, such as Fuller Buttes and Balloon Dome which tower over the precipitous San Joaquin River canyon. This is a great place to stop for a picnic lunch. You will find picnic tables and handicap accessible restrooms available. Camp, fish and boat on this beautiful man made lake in the high sierra. Pictured above is Mammoth Pool as seen from the Mile High Vista. A great place to stop and enjoy the scenery. Clover Meadow is home to a Ranger Station and a campground is located alongside the meadow. For campground information see link below. A wide spot in the road with paved parking area near a year-round creek of the same name offers Byway travelers a scenic view of Shuteye Peak and Little Shuteye Peak. A USFS Fire Lookout is situated on the main peak and can be seen with binoculars. Come for the pie, stay for the people. The Jones Store is a quaint country store along the second half of the Byway known just as much for the stellar hamburgers and delicious pie as it is for the hospitality of the owners. The store has a history going back nearly a century, and families that have been frequenting the business for generations. Enjoy a cold beverage and hot lunch as you talk to people who knew the area way back when. Learn more on Sierra Nevada Geotourism site, link below. As you are completing your journey, be sure to include a visit to the Nelder Grove Giant Sequoia area, home to the Bull Buck, one of the largest and oldest trees in the world. Welcome to Wagner's Store at Mammoth Pool. Wagner's Store was created as a supply post for workers building the dam at Mammoth Pool in 1957. A general store, mercantile store and a café provided workers with supplies and food necessary to sustain a working population. Although the café and merchentile store are gone today, the general store continues to serve the public on a seasonal basis. Follow a rock lined path to a wooden viewing platform to enjoy this unique rock formation. Arch Rock is one of very few natural rock arches in the Central Sierra. 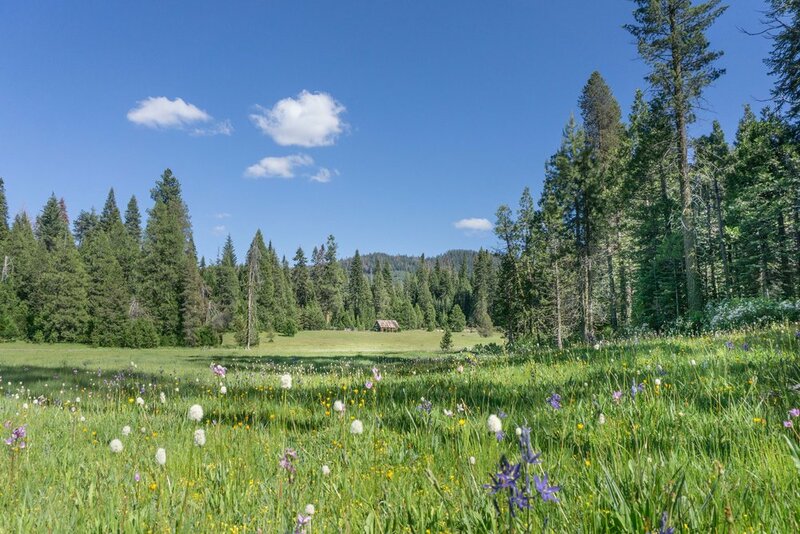 A perfect place to view wildflowers in mid summer, Jackass Meadows features a rustic wood boardwalk through a lodgepole forest and leads to a beautiful meadow bursting with tall grasses and seasonal flowers. Pictured above, Shooting Star flowers dominate the meadows on a warm summer day. Looking as if a giant placed this tremendous boulder on the tee for a game of geologic golf and then forgot about it eons ago, Globe Rock is one of the most photographed spots along the byway. Rummor has it that, Theodore Roosevelt had his picture taken at the geological oddity during a hunting trip. The nearly spherical rock was carved out of the granite thanks to the freezing and thawing action of water on the rocks. One of the Sierra's most visited rock domes outside of Yosemite National Park, Fresno Dome is a short walk from the parking area and offers fantastic 360 degree views of the surrounding landscape. Located just a few miles from the Sierra Vista Scenic Byway, Bass Lake is worth a slight detour. In the summer season enjoy swimming, biking and hiking. Check the events calendar at Visit Yosemite | Madera County and attend a live music event. Such as Jazz on the Lake (pictured above).